Superstar Components are well known for their budget wheels, and up until recently they’ve focused on selling their own no-nonsene rims on their cheaper sets and offering Stan’s or Mavic products on their higher-end offerings. But a year or so ago they launched their Sentinel and Tactic rims, intended for XC and trail use respectively and with weight, width and quality of finish to rivals premium brands – but cheaper of course. The Tactic rim has a 23mm internal width, laser-etched graphics and a huge choice of snazzy colours (or black). Isn’t that a lovely blue colour? 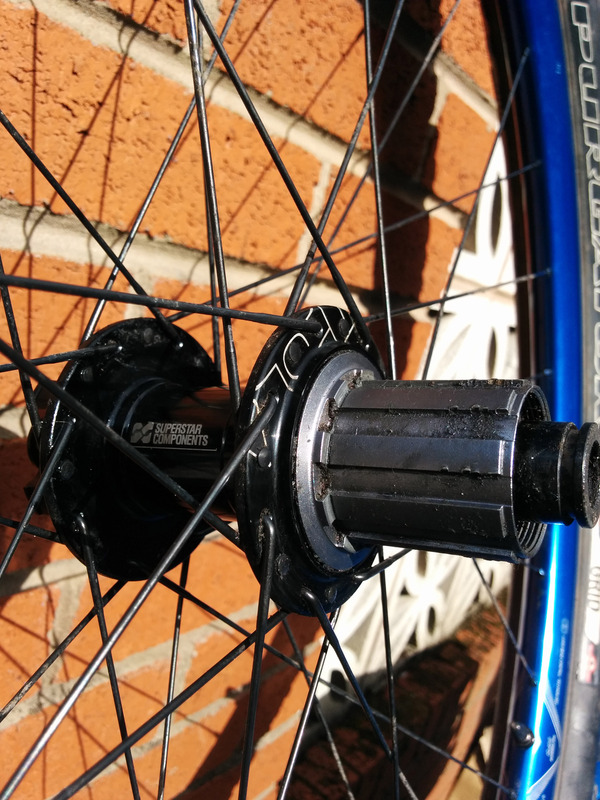 Likewise Superstar’s Tesla hubs are an attempt to offer a premium quality product at a mid-range price – and it certainly looks good on paper with 72 points of engagement, SKF bearings and easily swappable end caps for those pesky ever-changing axle standards. So when I switched over to big wheels for my trail riding, the Tesla/Tactic combo caught my eye as offering a good combination of features and weight at a reasonable price – which was £220 with an offer at the time that I purchased them. My original safe order of black on black wasn’t possible due to the black rims being sold out, so I took a chance on the navy blue rims – which I was actually really pleased with when they arrived and which looked amazing on my candy orange frame (with matching blue stem). I set the wheels up tubeless from the start using Superstar’s own valves and tape, and once I’d put two layers of tape on each rim they went up quick and easy with the Specialized 2bliss tyres I’m using. They actually had their first outing on my then-new FS 29er – and felt good straight away – light and stiff enough for my (reasonably rocky) local trails. The hub makes a low-key whirring noise which is quite pleasant and sounds expensive (if noises can have a monetary value) – and the pick-up really is quite impressive. On par with Mavic’s top-end MTB wheelsets. Riding the wheels on some particularly gnarly, bridelway descents with big rock steps in the Peak District, I also realised there was a bit more lateral flex than I’d like – causing a bit of a loss of confidence. The wheels were then moved over to my long-travel 29er HT, where that little bit of flex and light weight were a much better match for the light and stiff aluminium frame. Superstar label the rims as “AM” but I’d judge them more useful for trail riding than proper big mountains in their 29er guise – which isn’t surprising considering they only weigh about 450g. The wheelset in total weighs less than 1,800g – which is very competitive for wagon wheels. I eventually sold them on after getting an even-sturdier pair of wheels for my full-sus bike and moving the wheels from that to my hardtail. 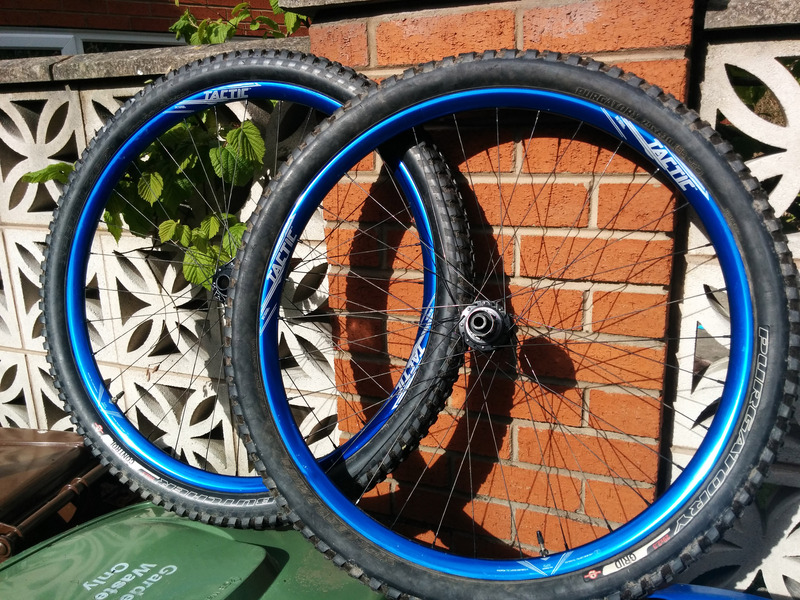 Personally I’ve realised I like a stiffer wheel on my 29ers, but these could be just the ticket for lighter riders or those who ride smoother trails.